The innovation resulting from the Microsoft HoloLens technology continues to amaze me. This platform enables designers to gain insight about their designs before they are built. The HoloLens and AR will enable doctors and medical teams to plan care more effectively. I’m especially curious about the ways trainers and educators will leverage this platform in their teaching. I just wanted to share a few application areas that have inspired me. I’m very thankful that my team and I have had the opportunity to build prototype applications for Microsoft HoloLens. In the picture above, you can see my first “hello world” experience with Microsoft HoloLens. (Yup! 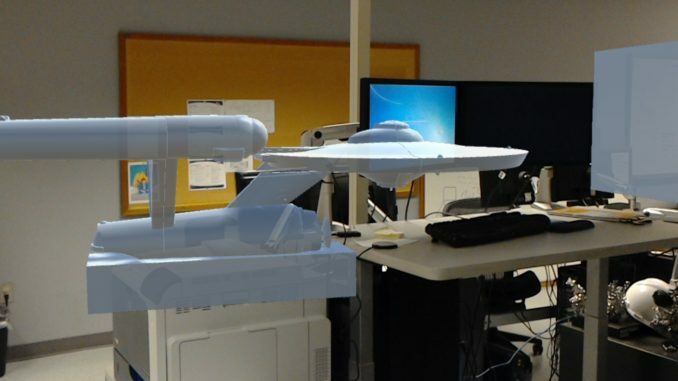 I’m a Star Trek Geek) Looking forward to building more apps for Microsoft Windows Holographic. Feel free to reach out to me if you’re interested in learning about how we can build a HoloLens prototype for your organization. Exploring the world of Mixed Reality.